You will need to use the Chrome browser and have the Pedigree Thief browser extension installed. After it is installed in your browser, click on the Pedigree Thief icon and select Options from the menu. Scroll down to MyHeritage section and make sure the button says "True." Close the options window. Important: You must import your data files in proper order--first, matches, then segments and finally ICW or Triangulation. After you have created your MyHeritage profile at RootsFinder, open a tab for MyHeritage. Click on DNA and then DNA Matches. Click on the three dots to the right of Filters, Sort by, and Search. 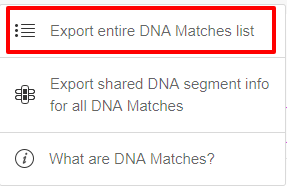 Select "Export entire DNA Matches list." MyHeritage will send an email when the list is ready. This will take a while. Time for some herb tea and a cookie. I'm thinking maybe some Orange Cinnamon and a ginger snap. They will send you a "zipped" file entitled ([your name] DNA Matches list [date]). Download, unzip the file and save as CSV. For step by step instruction on how to unzip the file and save as a CSV file, How to Unzip a Zipped File. Skip back over to RootsFinder. Click on Choose File, and select the CSV file you just saved. It will import in a few moments. After you have loaded your matches, you are ready to bring over your segments. Pop on over to MyHeritage. Go to DNA Matches like you did before and click on the three dots. 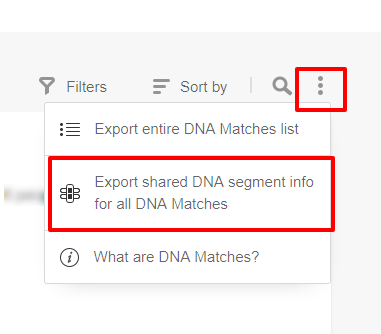 This time, select "Export shared DNA segment info for all DNA matches." It will take a little while. Time to go get some more herb tea. How about a nice Lemon Vanilla. This will produce another "zipped" file. Download, unzip the file and save as CSV. For step by step instruction on how to unzip the file and save as a CSV file, How to Unzip a Zipped File. Note: The segment file export from MyHeritage does NOT include Kit IDs, only names. That means that if your match list contains two people with the same name, their segment matches will get mixed up. To avoid this problem in the future, please ask MyHeritage to include kit IDs in their segment file export. If it is a problem, you can exclude particular people in your views by clicking on filters. 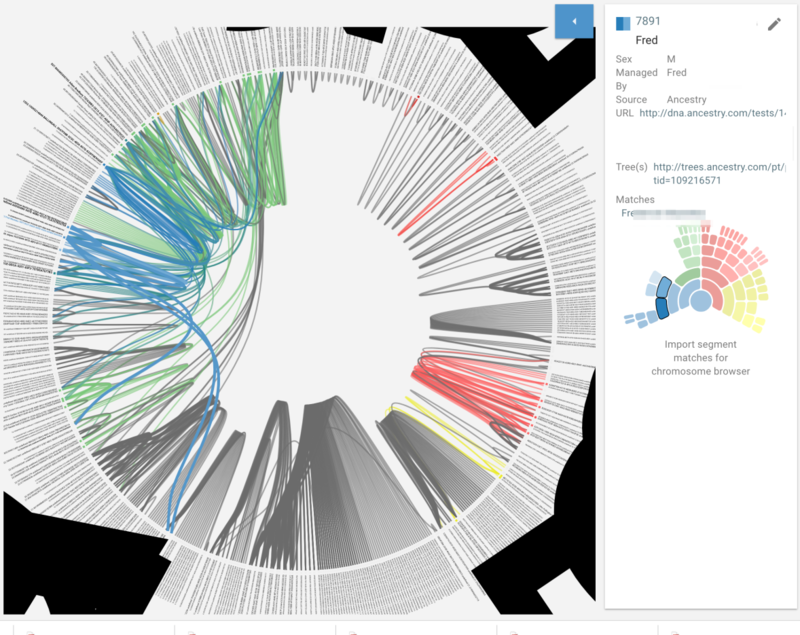 Skip over to RootsFinder and click on the down arrow in the blue circle to expand the DNA menu. Select the second icon with the stacked rectangles. Click on Choose File and select the segments file you just saved. It will load in a few moments. Here is a color-coded segment view. Ok, now that we have the matches and segments, it's time to get the ICW or triangulation. 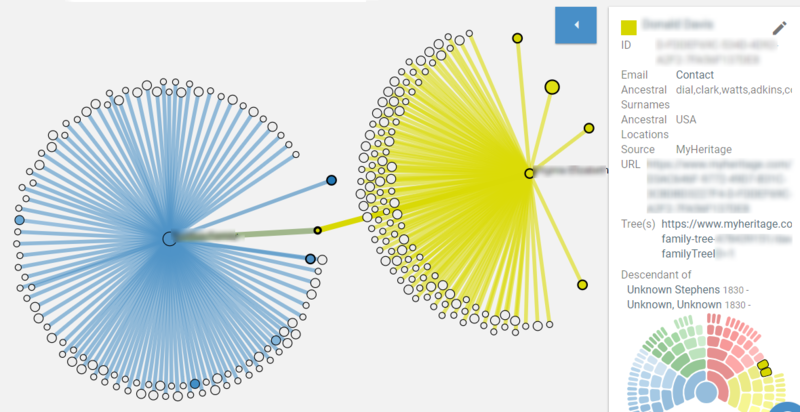 For this, you will need the Pedigree Thief Chrome Browser extension again. Pop on over to MyHeritage and open your DNA Matches like before. Make sure the Pedigree Thief icon is in color. If it is not in color, refresh your screen. 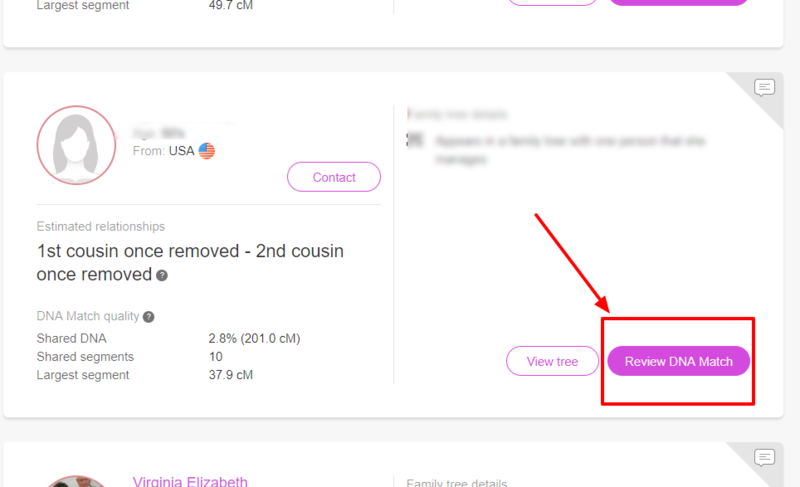 Click on the colored Pedigree Thief icon. It will ask you how many pages you want to download. We suggest downloading at least 50-100 pages. Click on "Read/Save Matches." You can choose to download "all" the pages, but be warned there may be thousands and it will take a long time. It may be time for a movie and snacks. It will start paging through your matches. Although this step is necessary to extracting your ICW data, you will never need this list again and don't need to save it anywhere. When Pedigree Thief is finished, scroll to the bottom of the MyHeritage page and click on " Review DNA Match" button. Important: My Heritage requires you to repeat these steps for each ICW, so choose the matches you are most interested in. Matches with very distant cousins may not help you very much. Make certain the Pedigree Thief icon in your browser is in color. If not refresh your screen. Click on the icon. It will think for a while. When its done, you can choose to upload the ICW to RootsFinder or you may go on to the next step and process your triangulation data. With ICW matches, match A and match B share segment(s) with you and with each other; however, the shared segment(s) may not be the same segment(s). Below is the ICW for one match. With Triangulation, match A and B share the same segment(s) with you and each other. Below is a triangulation view. Click on "Save ICW" in the Pedigree Thief window. It will think for a while. Note where it is saved. Once you have saved your ICW, hop back over to RootsFinder. Click on the down arrow in the blue circle and select the third icon with the triangle in it. Click on the Choose File button and select the ICW you have just saved. Now click on the "+" button in the top right and repeat the process for the other ICWs you wish to import. At MyHeritage, select the next person for whom you wish to compare ICWs. Click on the the Pedigree Thief icon. It will reload your matches. When it's done, click on the Save ICW button. Pedigree Thief will page through your ICWs for a while. Save the file when you are asked to and hop on over RootsFinder. Click on the "+" in the upper right. Leave the check box empty. Then click on choose file and select the new ICW you have just saved. Here are two ICWs displayed together. 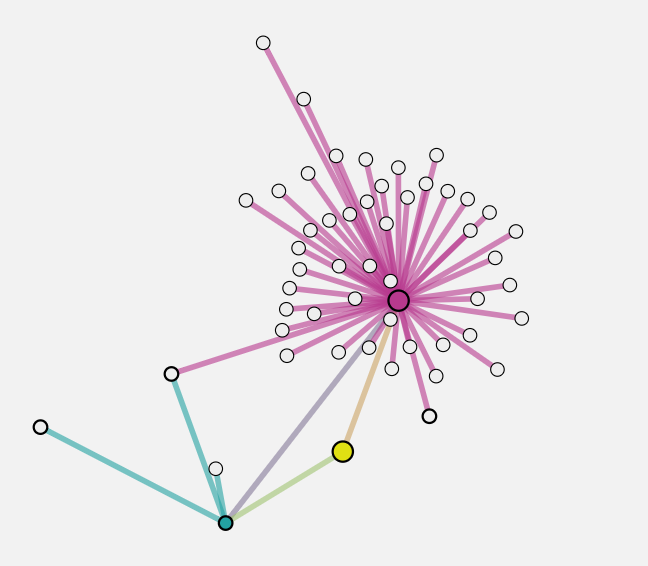 After Pedigree Thief has created the ICW data, you can opt to go on to triangulation. Select a person with whom you wish to triangulate. Important: Just as with ICWs, MyHeritage requires you to repeat the following steps for each person you want to triangulate with. On the MyHeritage page, navigate to a person with whom you wish to triangulate. Click on the review DNA Match button. If the Pedigree Thief icon is not colored, refresh your screen. Click on the Pedigree Thief icon. Its going to reload your matches for a few minutes. Select Read/Save [number] Triangulations button. Pedigree Thief will begin flipping through your MyHeritage Chromosome browser. It will take a while. You have time to call your college student or your mom. When it is finished you will be asked to save the data to your computer. Note where it is saved. After you save the triangulations, hop on back to RootsFinder. Click on the down arrow in the blue circle and select the third icon with the triangle in it. Click on the "Choose File" button and select the triangulation file you just saved. Below is a triangulation view. 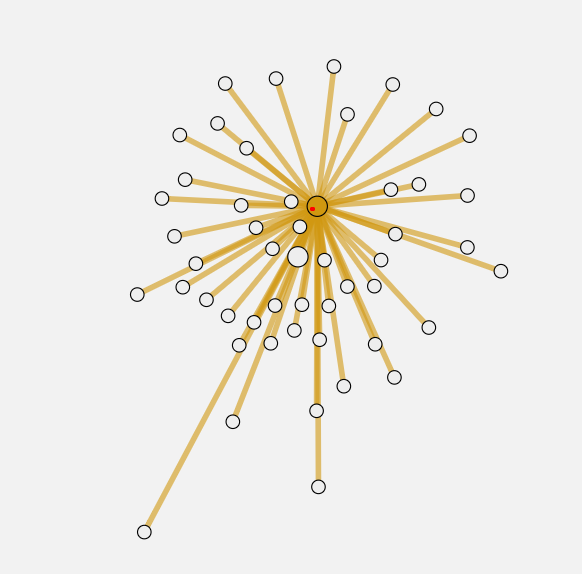 Here is our first triangulation. You will need to repeat this process for each triangulation. Go back to your MyHeritage DNA matches page. Select the person with whom you wish to triangulate. Click on the Review DNA Matches link. Click on the Pedigree Thief icon and select Read/Save [#] Triangulations. Call another relative or two, you've got plenty of time. Family history is about family, right? Save the triangulations when it's done. Hop back over to RootsFinder and click on the "+" button in the top right. 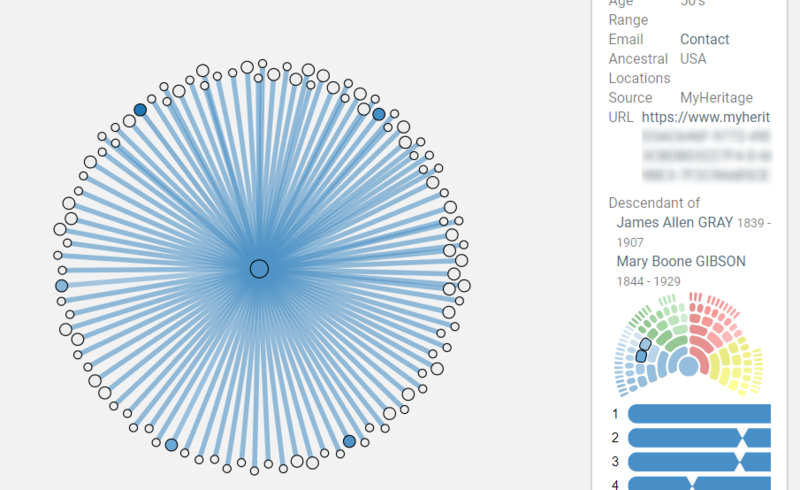 Then click on choose file and select the new triangulation you have just saved. Here are two triangulations displayed together. You can repeat this process for as many triangulations as you like. The Circle requires both the segment and triangulation data. 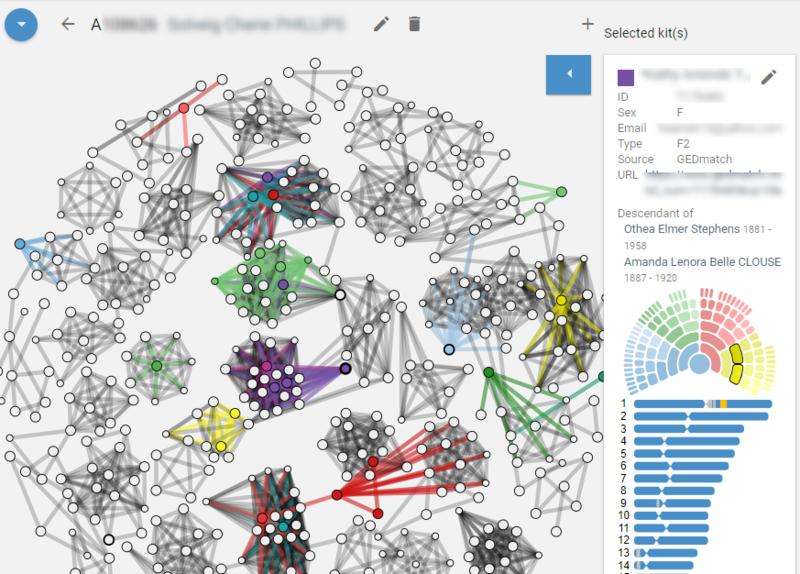 It will give you results when the segments and triangulation data are imported.